Calculating the average body is creating a body that no one actually has. In 1926 the U.S. military used the physical dimensions of hundreds of male pilots to design its first ever cockpit. They used all the measurements they gathered to determine what the average male size was and for the next three decades, the size and shape of the seat, the distance to the pedals and stick, the height of the windshield and even the shape of the helmets were all created for the average man that they had calculated. Not until the 1950’s did a young lieutenant find the flaw in averages. The army thought that male pilots had grown and no longer fit comfortably in the cockpit because of the growing number of plane crashes due to human error. This young lieutenant was assigned the task of taking measurements of hundreds of pilots, which is when he realized the fatal flaw in cockpit design. They were designing it for the average pilot, a man of proportions that not a single pilot they measured fit. In the book, End of Average, by Todd Rose, Rose explains with examples like the cockpit, the flaw in our thinking that average is a proper means of design. As you can tell by looking around, not one of us possess the exact same body yet today, over 50 years later, averages, with all its flaws, are still being used to improperly design things some of us use all day, every day, like your office chair. In the world of ergonomics, the flaw of average is old news; however, ergoCentric is still the only seating company that has learned that average doesn’t work for office chairs either. As Rose points out in his book, each person has many body dimensions that have to be considered and that’s why chairs have to be modular as well as fully adjustable. Company’s that have chairs in only three sizes or limited adjustments do not come anywhere near to addressing the issue of different bodies with different needs, nor do they warrant being labelled “ergonomic”. You shouldn’t expect the same chair to fit both a 6’4’’ employee as well as a 4’6” employee. Many seating manufacturers build “one-size-fits-all” chairs on the assumption that the same chair will fit most of your workforce. As a result, many people have become accustomed to being uncomfortable. They are either sitting on chairs that simply cannot be adjusted or modified to fit their particular needs. Sitting in the wrong chair in your workplace, day in and day out isn’t just uncomfortable, it can force awkward or static postures, excessive force, highly repetitive work, contact stress or static exertions are all contributing factors to work-related musculoskeletal disorders (MSD). According to the U.S. Bureau of Labor Statistics, MSDs account for 33% of all workplace injuries reported in the U.S., with an estimated cost between $45 and $54 billion annually in workers’ compensation costs, lost wages and lost productivity. Work place injuries can be prevented. Providing office workers with a fully ergonomic seating solution, by properly fitting your employees with a chair that fits them and their needs, and providing ergonomic training can decrease soft-tissue injury and have a significant impact on productivity. After the introduction of ergonomic office chairs 30 years ago there was a significant decreased MSD in the workplace between 1992 until 2007, according to data collected by Occupational Safety and Health Administration (OSHA). 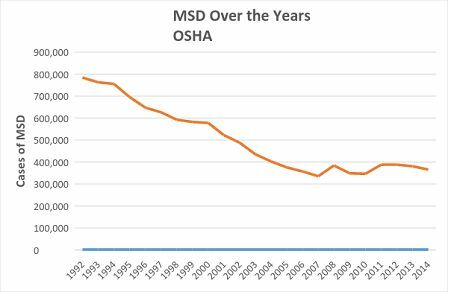 Since 2007 the cases of MSD in the workplace has not decreased. This can be associated to lack of accurate knowledge about ergonomics. Even when someone intends to buy ergonomically correct seating, the chairs they purchase don’t fit most people. And that’s because they are buying for, and the chair is made for, the average person that doesn’t exist! However, buying a chair that is the correct size is only the first step. You need to be able to customize that chair further by adjusting it. Unfortunately, even people that have a fully adjustable chair often don’t know how to use it. That’s why we are continuously improving our instruction systems, because we’re not going to get that line on the graph heading down again until we make Adjustability Understood™. Stay tuned for my next post about our new patented technology that will change the way you use your chair. Terry is the Founder of ergoCentric Inc. and has been instrumental in designing the company’s extensive line of ergonomic seating systems. To date he has over 20 patents and patents‑pending. He also wrote and produced The Anatomy and Biochemistry of the Human Body in the Seated Posture and has published many articles on ergonomic seating. He was a member of the technical committee that drafted CSA Z412‑17, Office Ergonomics – An application standard for workplace ergonomics. responsible employees-which are truly the backbone of your enterprise. Proud to be part of your successful network.